Why CATterrain? 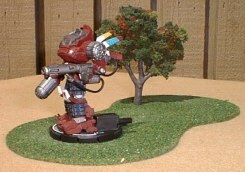 Our trees never impede a miniatures location, or obstruct range measurements. Each of these low-profile terrain pieces are completely flocked with tricolor turf and some lifelike grass. 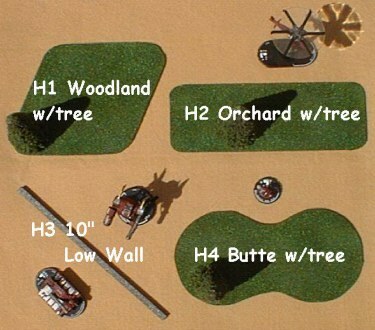 There are five pre-drilled tree locations in each piece of terrain for a simple yet effective 'peg & hole' tree placment system. Simply place any tree into any hole or take the trees off alltogether. 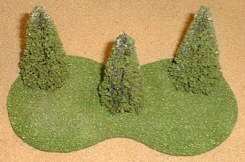 One Grand Central Gems medium pine tree is included with each terrain piece. This 1/4 inch high masonite terrain piece is painted with a textured, concrete urban gray fleck-stone effect.